Although I’ve very clearly come down on one side of the debate about rationality in economics, there is another war that I’ve just found out I’m in the middle of. 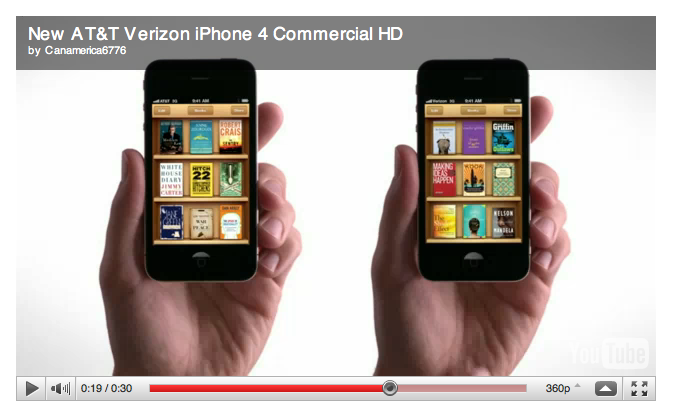 If you look very closely in the picture below from a recent iPhone commercial, Upside of Irrationality is one of the preferred books of the AT&T iPhone user! While it’s nice that Apple put me in the middle of this war between AT&T and Verizon, In line with their slogan that “two is better than one”; what would have been really nice is to have both of my books featured–one on each shelf.